Daimler CEO Dieter Zetsche was given a 3-year contract extension last month. 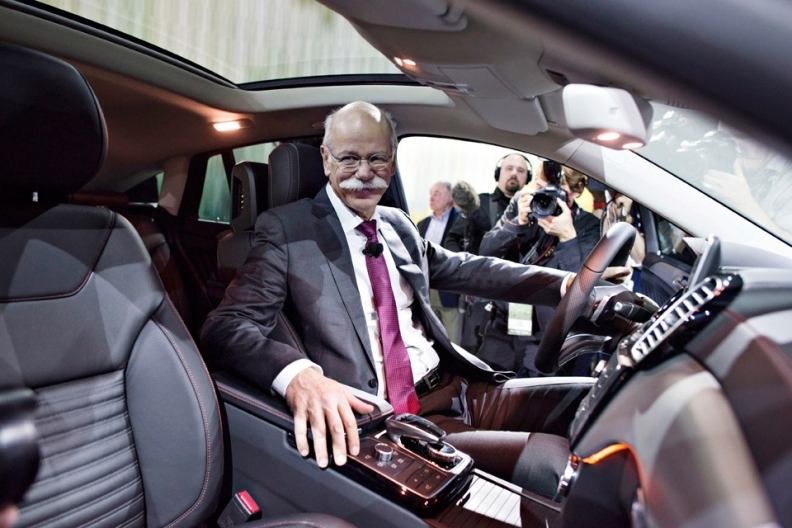 Three years ago Daimler CEO Dieter Zetsche arrived at the Geneva auto show a chastened man. He was forced to deflect questions about the fiasco surrounding his contract extension and was held accountable for poor 2012 results. China sales had fallen 7 percent despite a booming luxury car market and profitability had sagged at Mercedes, while rivals Audi and BMW were reporting new records. To put this into context, roughly a week prior to the 2013 Geneva show Daimler’s influential labor unions presented the supervisory board with an ultimatum. Unless Mercedes production chief Wolfgang Bernhard, a Zetsche protege famous for making deep cost cuts, was banished to the commercial trucks division the union wouldn’t sign off on a contract extension that Daimler Chairman Manfred Bischoff had already promised was a done deal. Labor won, leaving Zetsche wounded. He received a three-year extension instead of the expected five-year deal. That board meeting three years ago also threw Daimler’s succession plans into complete chaos. Bernhard, a former McKinsey consultant groomed to eventually lead Daimler, was sidelined. The shake-up reset the clock when it came to finding a new crown prince. The weakened CEO did his best to sell the deal in Geneva, saying that he had a mandate to lead the company until the end of 2016, which was about as long as any national government might receive in an election. At the time, his plan to overtake BMW as the world’s largest premium carmaker by 2020 no longer seemed ambitious, it seemed ludicrous. When the Geneva show kicks off March 1, Zetsche should be smiling. He can bask in the glow of last year’s superb results and his contract extension while simultaneously touting a fairly clear succession plan with Ola Kallenius leading the current field. Daimler’s 2015 annual report showed Mercedes’ operating margin from ongoing business climbed nearly 2 percentage points to 10 percent, meeting a target Zetsche set for sustainable profitability even before the arrival of this year’s key E-class sedan. Analysts at IHS Automotive also estimate Mercedes will overtake BMW as the best-selling premium car brand this year and keep hold of the title in 2017. Zetsche brushed off skepticism that the strong 2015 results were merely a result of Mercedes hitting the peak of its model cycle. With an average of six models launched every year, he recently told reporters and analysts that the company was more protected than ever from the vicissitudes of product life cycles. The massive 40 percent capex hike for 2016, he argued, moreover helped ensure that Daimler’s long-term future is secured by paving the way for future new models like its first premium pickup truck. Even analysts critical of the group’s stock performance such as Evercore ISI’s Arndt Ellinghorst acknowledge that Zetsche has delivered: “You’ve led probably the best self-help turnaround story in the industry,” Ellinghorst recently said to Zetsche. It’s fitting then that Daimler named 2016 its year of “Dream Cars” led by Geneva premiers such as the elegant C-class cabrio. For Zetsche, whose performance helped him pocket roughly 14 million euros in total pay, the year is already starting off on an absolute high.